I can hardly believe that I have had this blog open for 10 months! I love art and all things creative so I am sure that helps to make this blogging thing not seem like a chore. Anyway, I crocheted these mason jar toppers a little bit ago. The turquoise one started this whole mason jar topper thing. It was actually going to be a cup cozy. I wanted to see how it looked on something and lo and behold , I liked how it looked on my mason jar. SideNote: Brown Sack Crochet is where I post all my crochet stuff. You can find that here. So, I made a few more and stuck my art supplies in them. I have accumulated quite a bit of art supplies since starting this blog and pa-da-da-da-daa I;m lovin' it! 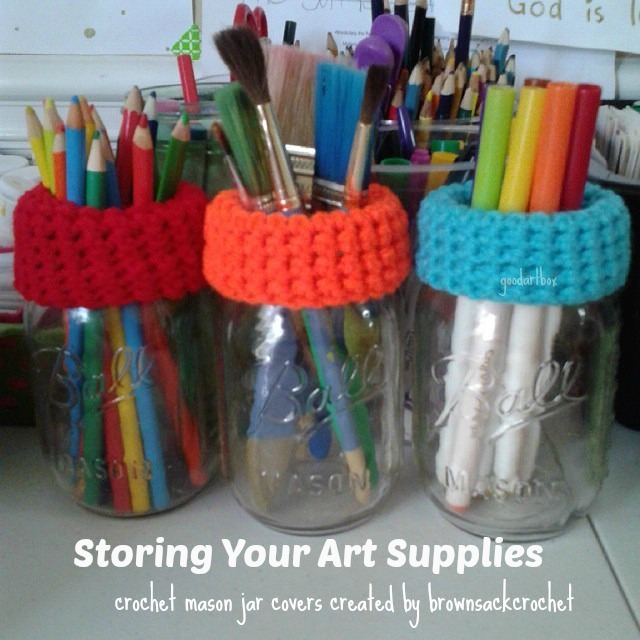 Mason jars are just one way to store your art supplies. ...just throwing out a few ideas for your art supply storage! What do you use to store your art supplies?